Chojun Miyagi, who was born at Naha City in Okinawa on April 25,1888, founded GOJU-RYU. Mr Miyagi had several students including Mr. Hanagi who was known for changing the name of "TE" to "Karate". Mr. Hanagi taught several students including Gogen "The Cat Man" Yamaguchi. Mr. Yamaguchi taught Taisung Park. Mr. Park was born in Korea but was raised in Japan and was a strong believer in the horse stance and totally dedicated to the belief that once an attack was started, it should continue until victory was assured. This theory of continuous KIYA which is the foundation of the GOJU-SHORIN Karate system was different from the separate Kiya belief of Mr. Yamaguchi. Mr. Park left Mr. Yamaguchi and started the SAKURA KUMI karate style of GOJU. In 1960, Mr. Park moved to the US to introduce and teach his system of KARATE. Mr. Park later taught Bill McDonald and Mr. LOPEZ. Mr. Park later moved to Hawaii to live with relatives. He later died in an automobile accident. Mr. McDonald later continued Mr. Park's teaching but created a change and combined techniques from the SHORIN system making the style softer. This became GOJU-SHORIN. Mr. McDonald continues to support the SAKURA KUMI method a system that still exists in Japan today. As a youth, my parents asked me if I wanted to try a free 2 week trial to Harrell's Tae Kwon Do School in Goldsboro NC they received from a coupon book. Having always been interested in karate and such I said yes. I was a bit fearful because I had no idea of how it would really be and honestly scared of getting hurt. After a couple of weeks, I realized it wasn't bad at all and I really liked it. One of Barry Harrell's advanced students also had a program on Seymour Johnson Air Force Base. His name was Walter "BUTCH" Martin. My dad, a retired army veteran, had always had access to get on base. Mr. Martin was not only a nice man but his class was also only $15 a month which of course made my parents happy. I was not the most coordinated kid so I know in retrospect that Mr. Martin must have been a very patient man. I promoted through the ranks and earned up to RED belt before Mr. Martin was transferred to TURKEY. Fortunately, another instructor named Fred Breeden took over the class and by age 13 I earned my Jr. Black Belt. I later lost interest and became busy in Jr. High and High School with Band, Wrestling, Track, and Cross-Country. Although I practiced periodically, my main love had switched to wrestling. After High School, I was admitted to East Carolina University. Initially missing wrestling I joined a wrestling club. At that time, I found out about a Tae Kwon Do and a Karate Club. 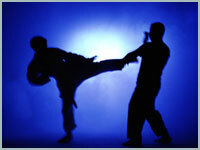 I had realized how much I missed the martial arts. The good news is that for $10 you could pay a year club membership and the club would pay for tournaments and more! Since I was already experienced in Tae Kwon Do I wanted to continue and grow in that style of martial arts but I met a great martial artist and now life long friend named Dale Land. Dale Land was such a nice person that I couldn't say no and the next moment I found my self signing up for the ECU Karate Club. I later learned lots and realized it was best not to don my Black Belt. I decided to wear a white belt again to start fresh. I still had to compete at a higher level because of my past Tae Kwon Do experience to be fair but in class I wanted to be taught like a beginner. I not only went to Karate Club Workouts but also went to the main school where Bill McDonald, 7th degree and founder of Goju-Shorin Karate Do, taught. My skills greatly improved. I also worked out with several world ranked kickboxers. Throughout my years at ECU I was active in tournaments, wrestling, and running for the ECU Cross-Country Team. Eventually on the 5 year plan, I did manage to graduate. Throughout those years Mr. Ormsby, another instructor of mine as well as Bill McDonald, would offer me odd jobs to help survive. I often taught beginner classes in Snow Hill as well as in New Bern and Williamston. Kickboxing was big at the time as well. I was hired to set up and take down the ring as well as take vital signs. I had also worked as a Certified Nursing Assistant so taking vital signs was easy work but setting up and taking down a ring for fights was long hard physical work similar to the work I did on the side with Eason Carpet and tile as an installation assistant. I didn't mind though since it was a guarantee that I got some grocery and rent money as well as got to meet lots of fighters and even got to work a fighter's corner once in a while. I continued to train of course but had no desire to step into the actual ring. While teaching for Sensei Ormsby's New Bern Dojo, Sensei Ormsby asked me to take over the class and I agreed. I was later promoted to adult level Black Belt in Tae Kwon Do by Master Lyndon Johnson and soon after earned my Black Belt in Goju-Shorin Karate Do by Master Bill McDonald. I had gone back to school for Occupational Therapy at Pitt Community College and after graduation continued to work at Pitt County Memorial Hospital. Later after Bill McDonald decided to retire from teaching Mr. Ormsby and I taught the majority of the classes at BEMJO Martial Arts Center. Later, the school was moved to a different location. Soon after there was a need for a program in Ayden so I took the challenge and decided for family reasons not to over extend myself. I deciced to stop teaching at BEMJO Martial Arts Center and focus on the Ayden and New Bern Programs. In 2007, Bill McDonald promoted me to Nidan. I continued to train with Master Bill McDonald as he continued to guide me on my journey as well as provide guest lecture appearance at seminars and other classes. On December 2, 2011, I earned the rank of Sandan; 3rd degree Black Belt in Goju-Shorin Karate and continue to train with Master McDonald 10th Dan and John Ormsby 5th Dan as well as other martial artists such as Tony Geouge 5th Dan and John Eason, Shodan. For a year ending in 2013, I created and led a program at A Child's Place Day Care of Vidant Medical Center formerly Pitt County Memorial Hospital. Due to expenses related to maintaining that program, I decided to stop it. In June of 2014, I started teaching again at the mother Dojo which was now named 10th Street Boxing Gym and was now located at 2717 East 10th Street in Greenville NC. I have continued to maintain the Ayden and New Bern Programs.